Silicon-free solar cells, light and flexible enough to roll up or use as window blinds, are under development at a University of Alberta lab. The solar cells are made using nanoparticles — microscopic particles just 30 to 40 atoms across — that are very cheap to produce from zinc and phosphorus, said Jillian Buriak, a University of Alberta chemistry professor and senior research officer of the National Institute of Nanotechnology. “We turn these things into inks or paints that you can spray coat onto plastics,” Buriak told Quirks & Quarks host Bob McDonald in an interview that aired Saturday. The resulting solar cells can be made extremely light and flexible compared to conventional silicon solar cells. The zinc phosphide nanoparticle solar cells are also cheaper than conventional solar cells because the process used to make them is very low-energy, Buriak said. Silicon solar cells are made from sand in a process that involves heating the materials repeatedly to very high temperatures – around 1000 C. As a result, Buriak estimated, it takes three to six years for the resulting solar cell to generate the amount of power used to manufacture it in the first place. On the other hand, the solar nanoparticles are “actually made in a standard, bubbling pot glassware set up in the lab — the traditional image of chemistry — ” from elements that are very abundant, Buriak said. Buriak and her colleagues published a description of their solar cell-making process in a recent issue of the scientific journal ACS Nano. 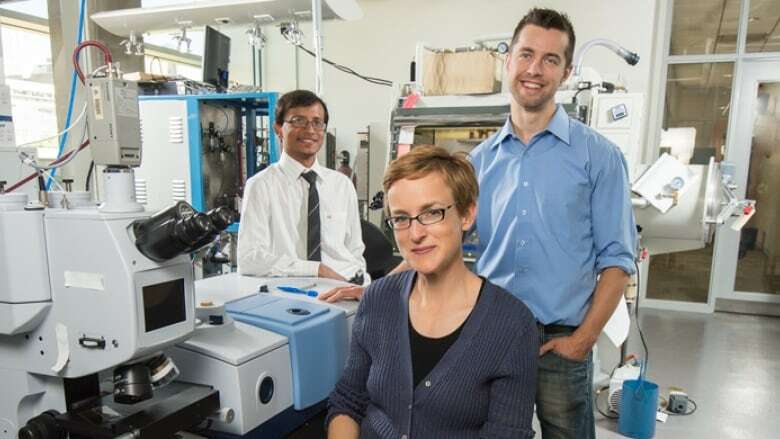 So far, her team has only made very small solar cells from their zinc phosphide nanoparticles, but they recently received funding from the Alberta government to apply the coating to larger sheets of plastic. “We actually use spray coaters that you can buy from an automobile touch-up shop for paint,” Buriak said. The efficiency of the solar cells is “not great,” she acknowledged, but that’s something her team is working on. The fact that they’re “so cheap to make,” she added, means they will only have to reach 7.5 per cent efficiency before they will be commercially competitive with conventional energy sources such as coal-electric generation. Buriak's research group has previously worked on other kinds of cheap, spray-on solar cell materials, such as flexible polymers.